While Lorraine and her wonderful family were here at my apartment last month, our friend, John, who was supposed to be here, and with whom we were really looking forward to connecting, but couldn't make it because of work obligations in Omaha, kept in contact and often made reference to the fact that my apartment in Chicago was on the 49th floor with a balcony, and thus being so high, was deigned The "Balcony of Terror." I will readily admit that the balcony from my apartment does hang in a semi-circular fashion almost five-hundred feet above the street level. 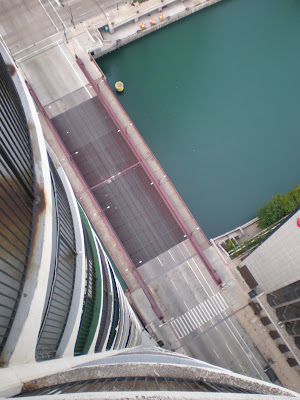 Walking toward the outermost, circumferential edge of my balcony, almost five hundred feet above the surface, even for those who have no fear of heights, does indeed strike an extreme feeling of falling, of dread, vertigo, and of overwhelming uncontrollability. Frankly, I love living fifty stories above the street. I love knowing that all lawn care, guest parking, garbage removal, valet parking, shipping & receiving, landscaping, snow removal, is all taking place five hundred feet below my coffee table. 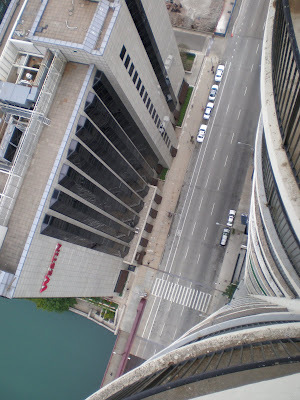 Looking straight down, 49 stories . Dearborn bridge looking down over the Chicago River. Looking straight down, onto Dearborn Street. Taking a photo UP at the eleven stories above me. Hey, is the air fixed? Ya, I would love to live where you live! I would love to live there too! I love your pictures from your balcony. 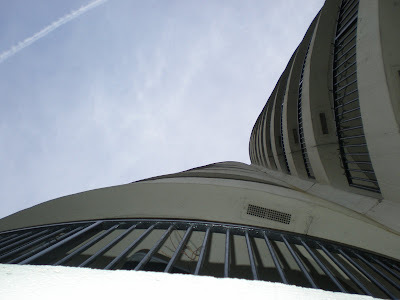 I get vertigo just looking at the photos. I love the Balcony of Terror and all it surveys.